Wisconsin Chimney Technicians provides the services you need to keep your chimney running smoothly. Our Milwaukee chimney sweep specialists have years of experience in providing the best chimney cleaning, inspection and repair. Chimney maintenance is highly important, especially during the winter months. It's equally important to utilize a fireplace in the safest possible manner. The following tips help ensure you’ll stay warm and safe as you use your fireplace all winter long. Fireplaces are not furnaces. They should not be the sole means to heat your home. 5 hours maximum should be the duration of any fire. While the fireplace is in use, keep the glass door open to preserve airflow and keep the screen closed to prevent sparks from damaging the carpet or furniture. If the room becomes smoky, you can open a window during use. Any air from outside will go up the chimney with the smoke. 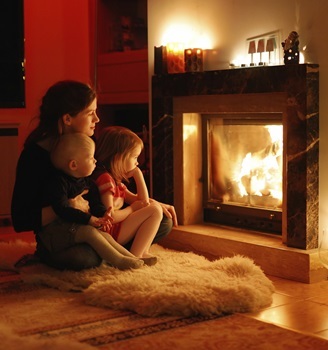 Never leave a fire unattended and use extra caution when children are near the fireplace. Placing a nonflammable rug near the fireplace will keep the carpet safe from potential damage due to sparks and embers. Keep tree branches and leaves from covering the top of the chimney and keep the area clear of any debris. Only use fireplace tools, never your hands, when moving logs around the fireplace. Use extra caution when moving burning logs or logs which have recently been part of a fire. Keep furniture and other flammable items away from the fireplace or stove area. Clean out ash and soot weekly to keep the area clean. This will prevent a potential fire hazard and allow room for a new fire. Wait at least 12 hours to clean up around the fireplace and wait at least a few days to remove ash from the fireplace. Coals and embers can remain hot long after the fire is out. If you remove ash, make sure to open the damper to prevent dust from clouding the room. Following these simple tips will keep your home safe as you use your fireplace or stove through the winter months. A fireplace and chimney work together, so it is essential to keep both operating to the highest standard. Between regular Milwaukee chimney maintenance services from our certified chimney sweep professionals and continual fireplace safety and maintenance, the entire system will continue to provide a wonderful and comfortable means to heat your home. Contact our Milwaukee chimney sweep specialists for superior chimney cleaning, inspection, and repair.